Pair of Lotus Headlamp Blanks for Race / Track Days Will fit the Elise from 2010 and the new ..
Front Mounting Strut for the Towing Eye. 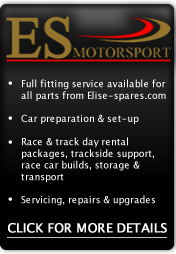 Will Suit Lotus Elise & Exige S1 & S2. M..
Genuine Lotus Elise S2 Left Rear Transom Grille. Part Number D117B0133F ..
Genuine Lotus Elise S2 Right Rear Transom Grille. Part Number D117B0134F ..
Genuine Lotus Nose Badge Part Number A089U1816F To Suit: Lotus Elise S1, Exige S1, Esprit..
Genuine Lotus Rear Transom L O T U S Raised Chrome Letters Self Adhesive Part Number A124..
Genuine Lotus Transom Badge Self Adhesive Part Number B117U0346F .. Pair of Lotus Headlamp Blanks for Race / Track Days. Will fit the Elise S2. Designed to r..
Lotus Elise or Exige S2 Pair of Extra Wide Air Intake Scoops. Remanufactured in glass fibre. ..